Graceful curves, sumptuously padded and covered in elegant white faux leather – this is the White Eclipse bar stool. The sweeping arc of the backrest which gently descends to meet the sides of the seat, invites you to sit back and relax and enjoy the generous padding. High density foam is covered in top quality white faux leather to create a supremely comfortable and practical seat. You can vary the height using the gas pump system operated by an inconspicuous lever, and you can rotate the seat in a complete circle. The lower section is all finished in gleaming chrome and includes a footrest connected to the central column. Floor protection is concealed beneath the circular base. The White Eclipse matches the dining chair in our Circles range, enabling you to create a unified theme for all your seating, or you can use the Eclipse alone to bring a touch of luxury to your counter or bar. 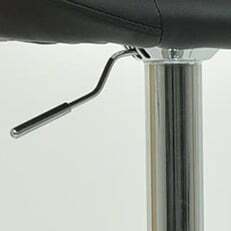 Our gas lift stool feature a matching metal handle.